In Matthew 27–28 we read about Jesus Christ’s terrible suffering and painful death for all mankind and about His Resurrection. Matthew showed how these events and others leading up to it fulfilled prophecy. After experiencing ridicule, trials, and abuse at the hands of Roman soldiers, Jesus Christ was crucified. His body was placed in a tomb. At the dawning of the first day of the week, an angel of the Lord proclaimed the joyful news that Jesus had risen from the dead. Many others were also resurrected shortly thereafter, a manifestation of the truth that the Savior’s Resurrection made possible the Resurrection of all mankind. After His Resurrection, Jesus Christ met His disciples at an appointed place in Galilee and commissioned them to take His gospel to all nations. President Gordon B. Hinckley taught: “The Resurrection of Jesus Christ was the great crowning event of His life and mission. It was the capstone of the Atonement” (in “Special Witnesses of Christ,” Ensign, Apr. 2001, 15). Matthew was obviously affected by the suicide of Judas, a fellow Apostle, but he knew it was also a fulfillment of prophecy. Elder Bruce R. McConkie (1915–85) of the Quorum of the Twelve Apostles wrote the following regarding the death of Judas Iscariot as the fulfillment of prophecy: “However desirable the thirty pieces of silver seemed before the deed, their ill-gotten weight became a crushing burden on the soul now. In his frenzy Judas discards them so as to fulfill in literal detail the remainder of Zechariah’s Messianic utterance about them: ‘And the Lord said unto me, Cast it unto the potter: a goodly price that I was prised at of them. And I took the thirty pieces of silver, and cast them to the potter in the house of the Lord.’ (Zech. 11:13–14. )” ( Doctrinal New Testament Commentary, 3 vols. [1965–73], 1:798). The Old Testament quotation Matthew cited (Matthew 27:9–10) may be a combination of words from Zechariah 11:12–13 and words from the prophet Jeremiah (perhaps Jeremiah 18:2; 19:1–2), even though Matthew cited Jeremiah as the writer. Early Christian writers knew the Old Testament prophecies so well that sometimes they combined the information from various sources. For information about the fulfillment of the prophecy regarding the 30 pieces of silver, see the commentary for Matthew 26:14–16. Pontius Pilate served as a very unpopular Roman prefect (governor) over Judea from A.D. 26 to 36. Shortly after assuming office, he angered many of the Jews by marching troops into Jerusalem bearing standards with a representation of the Roman emperor on them. The Jews viewed these standards as idolatry. He later appropriated temple treasures to build an aqueduct, which led to a public riot. Pilate also ordered the slaughter of certain Galileans (see Luke 13:1–2). When the chief priests took Jesus to Pilate, they apparently had changed their charges against Him from blasphemy﻿—a religious charge that the Romans did not consider a crime﻿—to sedition, a political charge recognized by the Romans (see Luke 23:2, 5; John 18:30). The name Barabbas ironically means “son of the father.” The crowd, most of whom were stirred up by the chief priests and elders, called for the release of Barabbas while rejecting the true Son of the Father. In one sense, we are all like Barabbas﻿—we are the sinful sons set free because the true Son of the Father was condemned to death. According to the Greek text of Matthew 27:26, Barabbas’s first name was Jesus. Jesus Barabbas was a thief, murderer, and traitor, while Jesus the Christ was perfect. Those who condemned the Savior to death were presented with a clear choice, and they chose evil. The law of Moses provided a foreshadowing of Barabbas’s release centuries before it happened. The law of Moses taught that once a year, on the Day of Atonement, the high priest selected two goats. One goat became the scapegoat and was released alive into the wilderness, while the other was “for the Lord” and was killed as an offering for the sins of the people (see Leviticus 16:8–10). The high priest then took blood from the slain goat into the Holy of Holies of the tabernacle. He sprinkled it on the lid of the ark of the covenant (called the mercy seat), symbolically making atonement for the sins of Israel. Gerald N. Lund, who later became a member of the Seventy, explained how the events on the Day of Atonement foreshadowed the Savior’s offering of His blood: “Christ, as the lamb of Jehovah as well as High Priest, shed his own blood to enter the heavenly Holy of Holies where that blood ransomed from their sins those who would believe in him and obey his commandments. (See Heb. 9:11–14, 24–28; 10:11–22; D&C 45:3–5. )” ( Jesus Christ, Key to the Plan of Salvation , 67). Pilate recognized that Jesus was innocent of the accusations made against Him; even his wife had warned him of Jesus Christ’s innocence (see Matthew 27:19–24). One provision of the Mosaic law stated that if a person was found to have been killed, the elders of the city could wash their hands to signify that they were not responsible (see Deuteronomy 21:6–7). There are also examples in Greek and Roman literature of washing oneself as a symbolic gesture of absolving oneself of responsibility for shedding another’s blood. Thus, when Pilate washed his hands, he may have been claiming innocence in a way the Jewish leaders would have understood. Washing his hands, however, did not allow Pilate to evade responsibility. Elder Jeffrey R. Holland of the Quorum of the Twelve Apostles noted that “Pilate’s freshly washed hands could not have been more stained or more unclean” (“None Were with Him,” Ensign or Liahona, May 2009, 86). For more information on Pilate’s role in the Crucifixion of Jesus Christ, see the commentaries for Luke 23:4–12 and for John 19:4–16. Over the past 2,000 years, people have sometimes used the statement “His blood be on us, and on our children” (Matthew 27:25) to blame all the Jews of Jesus’s time, or even Jews of later generations, for the death of Jesus Christ. Such accusations ignore scriptural accounts stating that a great many Jews of Jesus’s time believed in Him and that His Crucifixion was brought about by Roman authorities in cooperation with a relatively small group of Jewish leaders (see Matthew 26:3–5; 27:20; Luke 21:38; 23:27; John 12:42). Any anti-Semitism based on Matthew 27:25 also ignores scriptural testimony that the Lord loves the people of Israel and has a plan for their salvation (see Matthew 23:39; Romans 11:1, 26; 1 Nephi 19:13–17). Mormon, the Nephite prophet-historian, wrote, “Yea, and ye need not any longer hiss, nor spurn, nor make game of the Jews, nor any of the remnant of the house of Israel; for behold, the Lord remembereth his covenant unto them, and he will do unto them according to that which he hath sworn” (3 Nephi 29:8). Generally, a scourging consisted of being beaten with a whip 39 times (see Deuteronomy 25:3). Elder Bruce R. McConkie explained what it meant to be scourged: “This brutal practice, a preliminary to crucifixion, consisted of stripping the victim of clothes, strapping him to a pillar or frame, and beating him with a scourge made of leather straps weighted with sharp pieces of lead and bone. It left the tortured sufferer bleeding, weak, and sometimes dead” ( Doctrinal New Testament Commentary, 1:807). 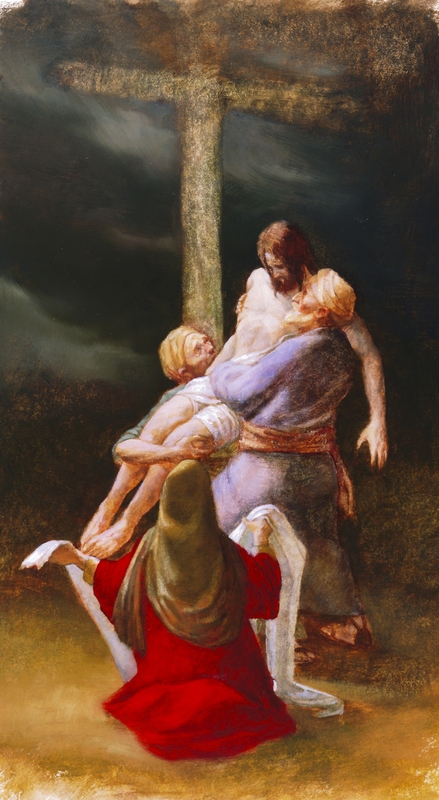 The torture and mistreatment the Savior received at the hands of the Romans (see Matthew 27:26–31) were part of the Atonement, along with His suffering in Gethsemane and His death on the cross. As Isaiah testified: “He was wounded for our transgressions, he was bruised for our iniquities: the chastisement of our peace was upon him; and with his stripes we are healed” (Isaiah 53:5). A theme in Matthew is that Jesus Christ is the rightful King of Israel. After the Savior was scourged, the Roman soldiers put a robe on Him, made a crown of thorns (plaited means “woven”) and put it on his head, and put a reed in His right hand. Then they mockingly bowed before Him and called Him King of the Jews. The robe was purple, a color known to be used by royalty (see Joseph Smith Translation, Matthew 27:30 [in Matthew 27:28, footnote a]; see also Mark 15:17; John 19:2). Golgotha. Tradition holds that the Lord Jesus Christ was crucified near here. The scriptures say that the Crucifixion took place at Golgotha (Aramaic) or Calvary (Latin). The traditional and oldest proposed site of the Crucifixion, burial, and Resurrection of Jesus Christ is the current site of the Church of the Holy Sepulchre. Gordon’s Calvary, sometimes referred to as the Garden Tomb, is adjacent to Golgotha, and in the 19th century it was proposed as an alternate site for the Savior’s burial and Resurrection. Many Latter-day Saints think that Gordon’s Calvary is the actual site of these events because of statements made by Church leaders. If Gordon’s Calvary is the site, then its location is symbolically significant. Gordon’s Calvary is on the mount called Moriah in the Old Testament. It was on this mount that Abraham was commanded to offer up his son Isaac as a sacrifice (see Genesis 22:3, 14), a sacrifice that was a similitude of the atoning sacrifice of the Savior. It is also noteworthy that this traditional site is north of the Jerusalem temple and outside the city walls. In Old Testament times, the law of Moses required that the sin offering, which was offered for an atonement or expiation, be offered at a location north of the altar and outside the camp of Israel (see Bible Dictionary, “Sacrifices”; Exodus 29:14; Leviticus 4:11–12; Hebrews 13:12). To read about Jesus Christ refusing to drink the vinegar and gall, see the commentary for Mark 15:23. “For indeed a death by crucifixion seems to include all that pain and death can have of horrible and ghastly﻿—dizziness, cramp, thirst, starvation, sleeplessness, traumatic fever, tetanus, publicity of shame, long continuance of torment, horror of anticipation, mortification of untended wounds﻿—all intensified just up to the point at which they can be endured at all, but all stopping just short of the point which would give to the sufferer the relief of unconsciousness. The unnatural position made every movement painful; the lacerated veins and crushed tendons throbbed with incessant anguish; the wounds, inflamed by exposure, gradually gangrened; the arteries﻿—especially of the head and stomach﻿—became swollen and oppressed with surcharged blood; and while each variety of misery went on gradually increasing, there was added to them the intolerable pang of a burning and raging thirst; and all these physical complications caused an internal excitement and anxiety, which made the prospect of death itself﻿—of death, the awful unknown enemy, at whose approach man usually shudders most﻿—bear the aspect of a delicious and exquisite release. Such was the death to which Christ was doomed” ( The Life of Christ , 640–41). Joseph Smith Translation, Matthew 27:39–40, reads: “And Pilate wrote a title, and put it on the cross, and the writing was, Jesus of Nazareth, the King of the Jews, in letters of Greek, and Latin, and Hebrew” (compare Matthew 27:37). Pilate, who knew Jesus was an innocent man and who had the power to set Him free, had the truth printed and placed on the cross over Jesus’s head for all to see. Which individuals reviled Jesus Christ while He hung on the cross? What in their words and actions indicates that they probably would not have believed in Jesus even if He had come down from the cross? “There is, of course, running through all of these temptations, Satan’s insidious suggestion that Jesus was not the Son of God, the doubt implied in the tempter’s repeated use of the word if. ‘If thou be the Son of God, command that these stones be made bread.’ (Matt. 4:3.) ‘If thou be the Son of God, cast thyself down.’ (Matt. 4:6.) These, of course, were foreshadows of that final, desperate temptation which would come three years later: ‘If thou be the Son of God, come down from the cross.’ (Matt. 27:40.) But Jesus patiently withstood that ploy also, knowing in due time every knee would bow and every tongue confess. “It is important to remember that Jesus was capable of sinning, that he could have succumbed, that the plan of life and salvation could have been foiled, but that he remained true. … He was perfect and sinless, not because he had to be, but rather because he clearly and determinedly wanted to be” (“The Temptations of Christ,” Ensign, Nov. 1976, 18–19). “It was the third hour” of the day, or about 9:00 a.m., when Jesus Christ was nailed to the cross (Mark 15:25). Matthew recorded that “there was darkness over all the land” (Matthew 27:45) from the sixth hour (about 12:00 noon) until the ninth hour (about 3:00 p.m.), which was when the Savior died. When the Light of the World died, darkness prevailed upon the land for three hours in Jerusalem and for three days in the ancient Americas (see 3 Nephi 8:20–23). The Savior’s cry of forsakenness was prefigured centuries earlier in the 22nd Psalm (see verse 1). Though the Savior had never sinned and had never been separated from the Father because of His own actions, He experienced that separation on our behalf during the Atonement. For more information on the withdrawal of the Father’s comforting Spirit while Jesus was on the cross, see the commentary for Mark 15:34. To read about each of the seven statements Jesus Christ uttered from the cross, see the commentaries for John 19:26–30. The Joseph Smith Translation reads: “Jesus when he had cried again with a loud voice, saying, Father, it is finished, thy will is done, yielded up the ghost” (Joseph Smith Translation, Matthew 27:54 [in Matthew 27:50, footnote a]). In the premortal world, Jesus Christ had selflessly offered to do the will of the Father for the redemption of all mankind (see Moses 4:1–4). With His mortal death, Jesus had now fulfilled that promise. The Holy of Holies was the most sacred room in the ancient temple; it symbolized the presence of God. Once a year, on the Day of Atonement, the high priest passed through the veil of the temple and entered into the Holy of Holies, where he sprinkled the blood of a sin offering to atone for the sins of all the congregation of Israel (see Leviticus 16). When the veil of the temple was “rent in twain” (torn in two) at the death of Jesus Christ (Matthew 27:51), it was a dramatic symbol that the Savior, the Great High Priest, had passed through the veil of death and would shortly enter into the presence of God. For more information on Jesus as High Priest, see the commentary for Hebrews 9:11–15, 23–28; 10:1. Elder Bruce R. McConkie wrote that in addition to the Savior entering the presence of the Father, “the Holy of Holies is now open to all, and all, through the atoning blood of the Lamb, can now enter into the highest and holiest of all places, that kingdom where eternal life is found. Paul, in expressive language (Heb. 9 and 10), shows how the ordinances performed through the veil of the ancient temple were in similitude of what Christ was to do, which he now having done, all men become eligible to pass through the veil into the presence of the Lord to inherit full exaltation” ( Doctrinal New Testament Commentary, 1:830). The Apostle Paul taught that just as the torn veil of the temple allowed symbolic entrance into the Holy of Holies, it is the torn flesh of Jesus Christ that opens the way for us into the presence of the Father (see Hebrews 10:12, 19–20). Prophets before the time of Jesus Christ had prophesied of the geologic upheavals that would signal the death of the Creator of the universe (see 1 Nephi 19:10–12; Helaman 14:21–22; Moses 7:55–56). It is not known why the verses in Matthew 27 about the Resurrection are placed where they are in the text, but it is clear that the appearances of these resurrected beings in Jerusalem occurred “after [Christ’s] resurrection” (Matthew 27:53; italics added), not immediately following His death. Scriptures confirm that Jesus Christ was the first person resurrected (see Acts 26:23; 1 Corinthians 15:20; Revelation 1:5). The Book of Mormon prophet Abinadi taught that those who were resurrected at the time of the Savior’s Resurrection were all the prophets and those who had kept God’s commandments (see Mosiah 15:21–22; D&C 138:38–51). “The empty tomb that first Easter morning brought comforting assurance, an affirmative answer to Job’s question, ‘If a man die, shall he live again?’ [Job 14:14]. “Through tears and trials, through fears and sorrows, through the heartache and loneliness of losing loved ones, there is assurance that life is everlasting. Our Lord and Savior is the living witness that such is so. “With all my heart and the fervency of my soul, I lift up my voice in testimony as a special witness and declare that God does live. Jesus is His Son, the Only Begotten of the Father in the flesh. … He became the firstfruits of the Resurrection. Because He died, all shall live again” (“I Know That My Redeemer Lives!” Ensign or Liahona, May 2007, 25). To help you better understand the Savior’s Resurrection, review the video segment “Jesus Is Laid in a Tomb” (3:29) from The Life of Jesus Christ Bible Videos, available on LDS.org. This segment covers Matthew 27:57–60. Joseph of Arimathea was a wealthy member of the Sanhedrin, the Jewish governing council (see Matthew 27:57; Mark 15:43). He was a disciple of Jesus Christ, “but secretly for fear of the Jews” (John 19:38). After the Crucifixion, Joseph put his position at risk as he “went in boldly unto Pilate” (Mark 15:43) and obtained permission to bury the Savior’s body prior to the Sabbath. Joseph used his own tomb for the burial of Jesus (see Matthew 27:60). Nicodemus, another member of the Sanhedrin, brought a costly “mixture of myrrh and aloes, about an hundred pound weight” (John 19:39) to anoint the body. Together, Joseph and Nicodemus fulfilled the Old Testament prophecy that the Savior would be “with the rich in his death” (Isaiah 53:9). The amount of myrrh and aloes purchased by Nicodemus was similar to that used in royal burials, indicating that the Savior’s followers acknowledged His status as a king (see 2 Chronicles 16:14). “After the Resurrection of Jesus Christ, which occurred on the first day of the week, the Lord’s disciples began observing the Sabbath on the first day of the week, Sunday (see Acts 20:7)” ( True to the Faith: A Gospel Reference , 145–46). See also the commentary for John 20:1–10. “‘He is not here: for he is risen, as he said. Come, see the place where the Lord lay’ [Matthew 28:6]. “Never had this occurred before. There had been only death without hope. Now there was life eternal. Only a God could have done this. The Resurrection of Jesus Christ was the great crowning event of His life and mission. It was the capstone of the Atonement. The sacrifice of His life for all mankind was not complete without His coming forth from the grave, with the certainty of the Resurrection for all who have walked the earth. “Of all the victories in the chronicles of humanity, none is so great, none so universal in its effects, none so everlasting in its consequences as the victory of the crucified Lord, who came forth from the tomb that first Easter morning. “Those who were witnesses of that event, all who saw and heard and spoke with the Risen Lord, testified of the reality of this greatest of all miracles. His followers through the centuries lived and died in proclamation of the truth of this supernal act. “To all of these we add our testimony that He who died on Calvary’s cross arose again in wondrous splendor as the Son of God, the Master of life and death” (“Special Witnesses of Christ,” Ensign, Apr. 2001, 15). What is similar about the instructions given to followers of Jesus Christ in these verses? What does this suggest about what the Savior expects us to do with our knowledge of His Resurrection? For additional information on the Resurrection of Jesus Christ, see the commentaries for Mark 16:1–7 and for John 20:1–10. “I think that of all the days since the beginning of this world’s history, that Friday was the darkest. “But the doom of that day did not endure. “Each of us will have our own Fridays﻿—those days when the universe itself seems shattered and the shards of our world lie littered about us in pieces. We all will experience those broken times when it seems we can never be put together again. We will all have our Fridays. “But I testify to you in the name of the One who conquered death﻿—Sunday will come. In the darkness of our sorrow, Sunday will come. “No matter our desperation, no matter our grief, Sunday will come. In this life or the next, Sunday will come. “Because of our beloved Redeemer, we can lift up our voices, even in the midst of our darkest Fridays, and proclaim, ‘O death, where is thy sting? O grave, where is thy victory?’” (“Sunday Will Come,” Ensign or Liahona, Nov. 2006, 29–30). Elder Neal A. Maxwell (1926–2004) of the Quorum of the Twelve Apostles taught that our gratitude for the Resurrection can affect how we perceive the negative experiences of life: “The gift of immortality to all mankind through the reality of the Resurrection is so powerful a promise that our rejoicing in these great and generous gifts should drown out any sorrow, assuage any grief, conquer any mood, dissolve any despair, and tame any tragedy” (“All Hell Is Moved” [Brigham Young University devotional, Nov. 8, 1977], 7; speeches.byu.edu). The lie recorded in Matthew 28:13 is extraordinary. It would have been very unusual for Roman soldiers to fall asleep on guard duty﻿—the penalty for doing so was death. It is also unlikely that the disciples could have removed the stone and taken the body of Jesus Christ without the guards taking notice. The implausibility of the story shows the desperation of the chief priests, who as Sadducees did not believe in resurrection (see Matthew 22:23). In the weeks that followed the Resurrection, they continued to suppress news of the Resurrection (see Acts 4:1–3). Matthew said the story of the body being stolen was still “commonly reported among the Jews” (Matthew 28:15) at the time he wrote his Gospel, probably sometime after A.D. 70. 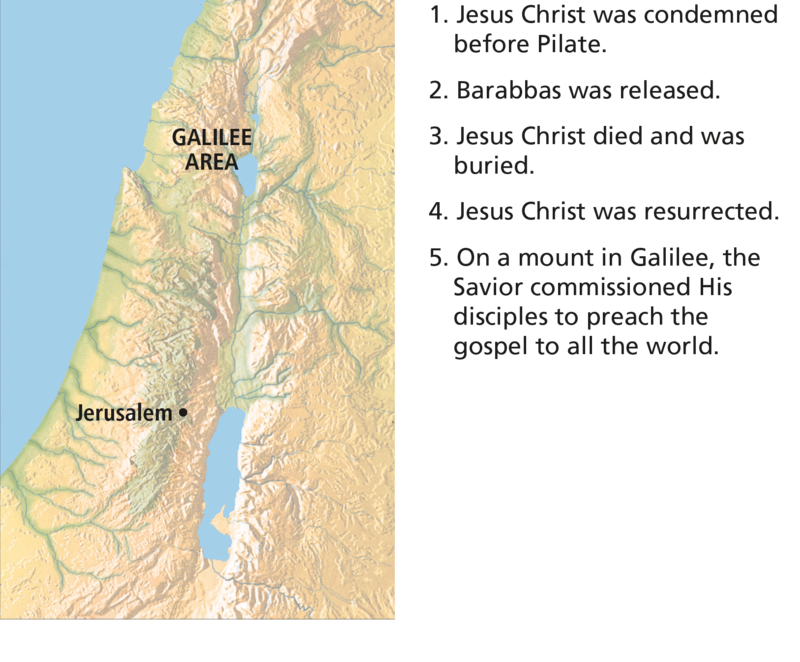 Matthew 28:16–20 records a meeting of Jesus and His disciples in Galilee after the Resurrection. At this time, the Savior said, “All power is given unto me in heaven and in earth” (Matthew 28:18). He spoke these words as a resurrected, glorified Being. The Doctrine and Covenants helps us understand that Jesus Christ did not possess “all power” when He was born into mortality, but that He received it later (see D&C 19:2–3; 93:12–17). This power included power over life and death, power to be resurrected, power to exalt, power to execute judgment, power to destroy Satan, and power to rule in the heavens. The Savior commissioned His disciples to take the gospel to “all nations” (Matthew 28:19). This verse is the culmination of many indications throughout the Gospel of Matthew that the gospel would eventually go forth to the Gentiles (see Matthew 4:15–16; 8:5–13; 10:18; 13:47; 24:14). In the New Testament books of Acts through Revelation, we read about how the disciples obeyed this commandment to take the gospel to all nations. President Dallin H. Oaks of the First Presidency taught that we all have the responsibility to carry out the Savior’s commission to bring the gospel to the world: “To proclaim the good news of the gospel of Jesus Christ is a fundamental principle of the Christian faith. Three of the gospel writers report this direction by the Savior. … Matthew quotes the Savior’s command, ‘Go ye therefore, and teach all nations, baptizing them in the name of the Father, and of the Son, and of the Holy Ghost’ (Matt. 28:19). [See also Mark 16:15–16; Luke 24:46–47.] … Applying the Savior’s directions to our day, modern prophets have challenged each of us to share the gospel” (“Sharing the Gospel,” Ensign, Nov. 2001, 7). The Greek phrase translated as “teach all nations” (Matthew 28:19) implies that the Apostles of the Lord were to find and baptize disciples of the Savior in all the nations. Receiving baptism is one of the requirements of becoming a disciple. Matthew 28:20 refers to additional teaching after a person is baptized. The writings in the rest of the New Testament consistently describe the baptism and instruction of converts. The Savior promised to be with His followers always, a promise that must have been of great comfort to them. President Thomas S. Monson promised that as we serve the Lord, He will be with us: “Whatever our calling, regardless of our fears or anxieties, let us pray and then go and do, remembering the words of the Master, even the Lord Jesus Christ, who promised, ‘I am with you alway, even unto the end of the world’ [Matt. 28:20]” (“They Pray and They Go,” Ensign, May 2002, 51). Consider how Jesus Christ responded to Pilate, the chief priests, the Roman soldiers, and others who mocked and insulted Him. What can you do to follow the Savior’s example when you are falsely accused or mocked because of your beliefs? How would you explain the necessity of Jesus Christ’s death to someone who is unfamiliar with Christianity? The Resurrection brought joy to those who followed the Savior. List the ways that your belief in the Resurrection brings hope and joy to your life. Briefly review Matthew 26:36–27:50 and John 19:26–27. Make a list of the individuals to whom Jesus Christ showed compassion during His last hours of mortality. Write a description of what Jesus said or did to demonstrate compassion for each one.